CC0 – Public Domain. Pexels. There is a special poignancy about the neonatal intensive care unit on Christmas day. Whilst billions around the world are celebrating the birth of one special baby, we are struggling to care for 20 or more desperately ill and fragile newborns, tiny human beings who cling to life with the help of advanced medical technology. Today I am tucked away in the nice warm office of Dr Hilary Marlow, Biblical Scholar and Course Director at the Faraday Institute for Science and Religion, who will be talking to us in this Christmas podcast. Hello Hilary! There is a definite science and faith link in the story of the birth of Jesus. Colin Humphreys is Professor of Materials Science at Cambridge University, and is one of the people who has helped to date the birth of Jesus more accurately in recent years. I’ve heard him tell the story of how he saw in his daughter’s ‘Great Men of History’ book that the dates of Jesus’ birth and death were not known very accurately. Being a Christian, he thought it was important to know a bit more about such momentous happenings as the nativity and crucifixion of Christ. He got together with an astrophysicist from Oxford University, WG Waddington, to work out the most likely dates of both events. The Nature paper that he and Waddington then wrote on the date of the crucifixion is his most cited scientific paper – a somewhat unusual thing for someone whose stock-in-trade is electron microscopy. There’s a good summary of Humphrey and Waddington’s work on the date of the birth of Christ in the journal Science and Christian Belief. There are debates about what the ‘star of Bethlehem‘ might be, so it’s harder to pin down the date of Jesus’ birth. But Humphreys says that ‘The evidence points to Jesus being born in the period 9 March-4 May, 5 BC, probably around Passover time: 13-27 April, 5 BC’. Happy Easter? 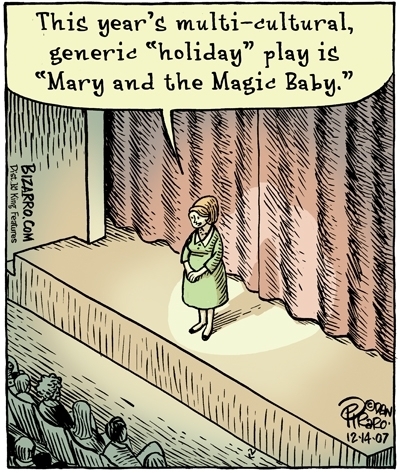 And finally, a Christmas cracker joke to finish the year off in style. Q: Why did the Rooster crow before daybreak? A: His cluck was too fast.